In this unit students will examine fundamental aspects of the computing environment including hardware specifications, peripheral devices, software and applications, operating systems and basic programming codes and languages. This unit investigates the essential philosophy and logic of programming, including models for input, output, and processing. Students will learn strategies to plan programming tasks, including pseudo-code. Students will construct simple programs using a different logical, mathematical and algorithmic strategies. In this unit students will develop more advanced programs, and investigate elements of the software design cycle including: determining program specifications from clients, developing milestones, the products of software development, and the strategies behind debugging and troubleshooting. In this unit students will use various problem solving strategies to collect input, store information, and generate outputs. Students will learn to read and write information to data files. This unit also investigates various ethical issues arising in computer science. In this unit students learn how to create arrays, and how to write programs that declare, initialize, modify and access these arrays. Students will write algorithms with nested structures, and sub-programs, and algorithms that perform simple data management tasks. This is a programming project representing the stages in the software development cycle worth 15% of the final grade. Java Development Kit (JDK) from Oracle (A link to download this software for free is provided in the course). Eclipse IDE (A link to download this free software for Mac or Windows is provided in the course)â€‹. A4 use proper code maintenance techniques and conventions when creating computer programs. B4 apply a software development life-cycle model to a software development project. C3 demonstrate an understanding of the software development process. D3 describe postsecondary education and career prospects related to computer studies. Communicating: Through the use of discussions, this course offers students the opportunity to share their understanding both in oral as well as written form. 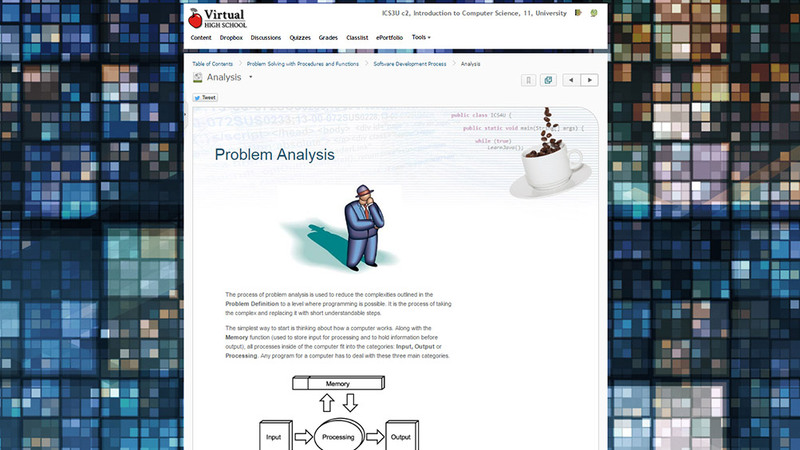 Problem Solving: This course scaffolds learning by providing students with the basic knowledge needed to understand computer science and building off of this knowledge as they progress through the course. The course guides students toward recognizing opportunities to apply knowledge they have gained to solve problems. Connecting: This course connects the concepts taught to real-world applications (e.g. students will write programs that can read and write files, a very useful skill in many real-world applications). Representing: Through the use of examples, practice problems, and sample code, the course models various coding practices, poses questions that require students to use different representations as they are working at each level of conceptual development - concrete, visual or symbolic, and allows individual students the time they need to solidify their understanding at each conceptual stage. Guided Exploration: The course and teacher guide students through the exploration of a variety of coding practices and procedures necessary to be successful in computer science.